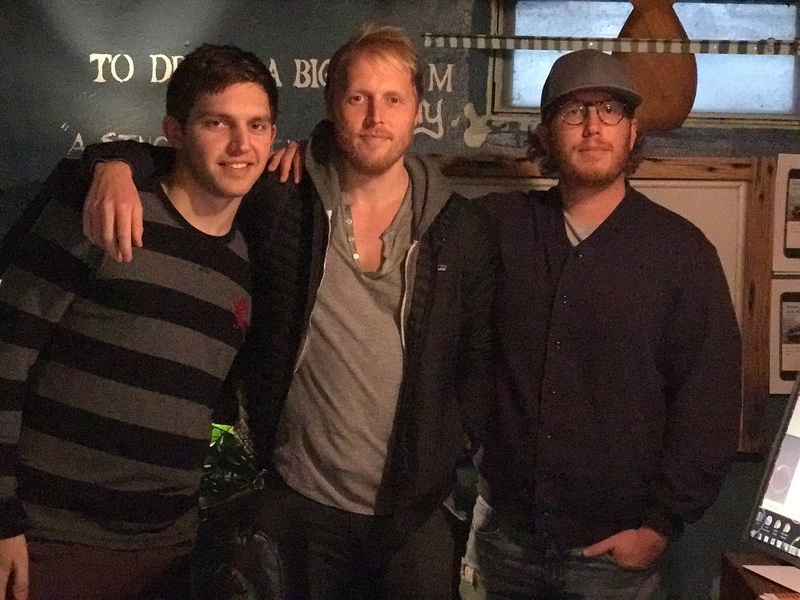 Check out what these guys have come up with to help keep up with the ‘Jones’ by building a community rental program for all of our stuff! What do you want to rent for the summer!!! Romy: Welcome to the Bonfires of Social Enterprise with me! Romy. Yup, you have me again for another conversation with an innovative social enterprise. 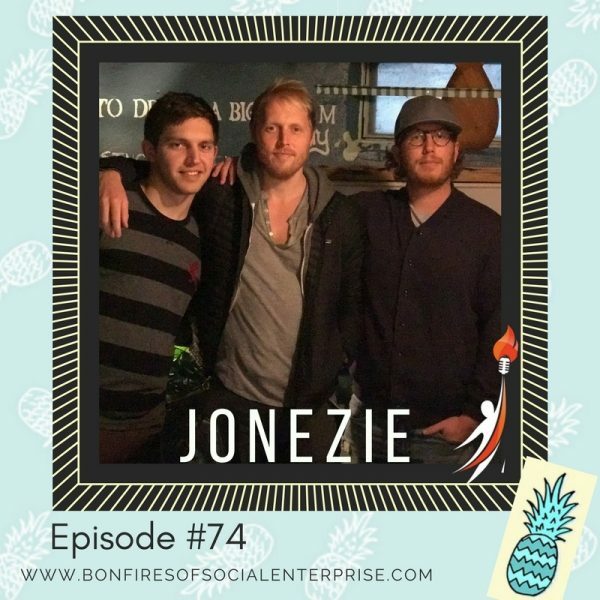 On this episode, we talk with Matt and Lenny from a new platform called Jonezie. They have moved back to Michigan from other experiences in social enterprise around the globe to create this great community rental program. Romy: Okay. So we've got Lenny and Matt here, guys, on the show with us. So let's talk about what's Jonezie? Matthew: Good question, take it away Len. Zachary: Well Jonezie is a platform that let's people list anything that they might have that they don't use all the time. They can list it on Jonezie, and someone in the area can rent it from them. You make a little extra money, and someone in your area doesn't have to go drain their savings account buying the item, they can just rent it for a couple of days or however long they need it and ... you know ... they both win. Romy: So for our listeners in some of the other countries, when we say platform that might be like a digital platform, an online platform, right? So how did you guys come up with this idea? Zachary: Well I ... me and my wife, girlfriend at the time, just moved into our house. It was like the first nice day out here in Michigan, and everyone was out riding their bikes, or running, and I just really was craving a bike ride. We went to the store, and I realized a decent bike was like anywhere from six hundred to eight hundred dollars. I mean I could have bought them, but I knew I would have ended up with buyers remorse or we wouldn't end up using them and they would be in the basement and our house is kind of small, so it's like more things taking up more space. We were sitting on the porch ... we didn't end up buying the bikes, and I saw our neighbor, they came in, him and his wife, and they were on their bikes and it was like "How cool would it be if I could just give em like twenty dollars, I'd use their bikes, drop em off when we're done, he'd make a little side cash to go out to dinner with, and we got our bike ride.". So as the night went on, I kept on thinking about it. Next day I called Matt, and I was like, "Listen I think I have something here. I want to know your thoughts.". Matt was my entrepreneur friend, so I felt like it was appropriate to reach out to him and just play the idea off of him. We kept on talking about it and we ended up talking more about it, and we're like, "Should we do this? ", and I was like "Yeah. How do we do this?". He was like, "Well, we are gonna build a landing page and let's gauge what our networks think. If they think it's a good idea maybe we discuss it more.". That's exactly what we did. Romy: The virtual world of pop-up. Those are the retail pop-up, it's the virtual pop-up that's the landing page isn't it? Did you ever ask your neighbor for the bike or it was just, it just planted that idea? Zachary: Recently I told him about it because he keeps on wondering why there's so many cars parked at my house. Well its ... I had an idea cause I saw you riding your bike. He's like "Oh. [inaudible 0:4:01]"
Romy: No kidding, that's so good! Matthew: Yeah. That was day one, and that was sort of like, we were sort of like, "Okay, how can we default the action right the now? How can we try to validate whether or not other people are going to be just as excited about this idea as we are?". So quickly put up that landing page and just pushed it out on social media. Lenny and I both made a post on Facebook and Instagram, and it was basically like URL was just detroitrentalsinc.com, and the text on the landing page just said: "rent anything from anyone in your area." Literally went on google and just searched for a garage and that was the image of it. So it were just an image of a garage and said: "rent anything from anyone." I don't know, maybe this is good, this is all we need right now to see if people are actually, gonna be attracted to the idea. We posted on social media and we started getting phone calls, and text messages, and people were leaving comments, and people were saying "oh my gosh, I wanna list my camping equipment", or "I want to rent a belt sander so I build a coffee table". I think the idea then expanded beyond what originally even thought it could be because of everyone else's excitement, and we were like less about us and this is more about building something for everyone else around us. It seemed like there was demand there. So we kind of just looked at each other and we're like, "Okay. We actually have to do something.". We have to figure out how to build the actual platform so that people can list stuff, and rent things, and I don't have a background in writing code or programming, nor does Lenny. One of the first things we did, was we jumped in the car and went to Ann Arbor and basically at U of M's campus in the computer science building, trying to look for developers. Romy: Oh my gosh. Awesome. Matthew: Knocking of the shoulders of different students and we're like, "Hey, you look like you might know something about programming, would you be interested in helping us?". It was just like, "No, no, you guys are weird. I want nothing to do with this.". We had zero credibility, we were just two guys that showed up at this college campus and talked to probably fifteen or twenty people, tried tollering up. Zachary: Played a couple games of Foosball. Matthew: Nothing worked. So we were like, "Okay, back to the drawing board. We need to find a programmer, but we just don't have one.". We ended up posting something on Upwork, which is essentially if you are looking for a freelancer or if you want to be a freelancer, then you can sort of get connected to people that way. That's when we found Andy. Andy is co-founder of Jonezie and he is just sort of a Godsend. He is an amazing dude. Zachary: Never says "No. ", and if he doesn't know how to do something, he teaches himself how to do it ... no [inaudible 0:7:11] vocabulary. Another cool fact about the day up to Ann Arbor was also the day we figured out the name Jonezie. Zachary: I still remember that day so clearly. Matthew: It's a magical day. Matthew: It was a very magical day. Zachary: Yeah. We were just planning out the idea. We're like, "You know, the landing page, we can't keep it a Detroit Rental Inc forever.". It's ... we want to be more than just Detroit on a day and that just not a name to go with. So we ... for like weeks we were just going back and forth of names, which is probably the most fun ... doing your own businesses and naming your baby. Zachary: And you don't want to do it lightly. It took a couple weeks but that was the ... or a week or so ... we drove up to Ann Arbor we were playing off each other like, "What are you thinking?". I'm like, "Keep up with the Jones'". Matt was like "Jones', yeah I've heard that term before and that's cool. ", but I'm like "That's also like I'm jonesing to go on a bike ride or like ... you just wanting to go do something.". We kept on playing with Jones' and then it turned in to Jonezie. Romy: Yeah, it's so catchy and easy. Romy: It's refreshing. It's got like this refreshing feel, but I get it. It's a lot of fun with it. Yeah. Matthew: Yeah and I think that was a big goal for, it to, was that what we have realized with Jonezie and people that are actually listing stuff and renting it out to other people is there is kind of a level of discomfort involved in something that you own, that you've loved, there's probably some form of sentimental value there, and to be willing to rent it out to someone in your area there's like a little bit of discomfort. The way that we are really focused on building a brand is all around trust, right? When it comes to the name Jonezie, we just think it's fun, it's playful, it's trustworthy, it's approachable, and we just felt like it was ... as soon as we came up with it we were like, "Oh my gosh, that's perfect!". Romy: Yeah, that's so good. Matthew: Cool. Thank you for doing that. Romy: Wow, so how did you, did it just organically started to come up as you asked people? Matthew: Yeah, and that's exactly how it looked. So like we said, we put up the landing page, we put up the idea of what we were gonna be working on. And that reaction was awesome; people had so many ideas. I mean, today people are still connecting dots, for my how Jonji is. But it wasn't until we actually started building the site, and testing the site where I would go to my friends and I'd be like, "All right, well love the idea let's start listing some things." And they're like, "Ooooh, yeah. About that." I don't want to rent anything, I like the idea but I don't want to rent anything, so that there's gonna be - we're gonna have to build a very trustful company and yeah, that's what it's gonna take. It's more than just the idea. You have to build a company that people rely on, and people that trust when I'm gonna put it up that my things are secure. Like, if something happens, I'm okay at the end of it. We had to really go to drawing board on how do we make that happen? How do we ensure that everyone's happy at the end of the day? It's still getting tweaked out every now and then, but I think we're there. Yeah. Romy: Yeah, but I think you guys are hitting on something that's so important for us to address as a society. I mean, we're a bit too attached to our stuff. Romy: And it's we can't be in this place of like, "Oh I've hoarded enough, therefore I'm gonna give it to the charity." There is this middle space. Romy: Nothing wrong with that, but like stuff you only use once a year or twice a year, or whatever, that could be available. So one question I had, and I'm like diving in for it personally, is I noticed on your site you're starting with the geographic area, right? Is it Oakland County of Michigan? Matthew: Yeah, it's primarily Southeast Michigan. Romy: So one of the questions I had, personally, is my husband and I moved way out in the - we are on the very Northwestern tip of Oakland County. We're like way up there. Romy: We moved way out in the rural area from the city, and we have a bunch of stuff and we thought, "So how does that work with people if you live on the edge of the area?" Romy: How does it work to get the stuff to people? Matthew: Yeah, so that is sort of up to the lister. You, as the lister, we really hope that people that are listing these things are gonna be super motivated to help out their renter. But at the end of the day, we also think that the renter should be motivated enough to go to the lister to pick up those items. Matthew: Yeah, so if I'm renting something from you, I think sort of the default is, I'm gonna come get it from you. And then when I'm done with it I'm gonna drop it back off to you. But there might be some cases, and we're just not sure yet, because I don't think we have enough data. It's still super early, like we launched our beta two months ago, so we're still sort of in this phase where we're still figuring stuff out, and we don't necessarily have all the answers but we are starting to build assumptions. So as a default, the renter would go and pick up the item, and then when they're done with it they would go and drop it off as well. Romy: See what happens, I'll be your test case. Romy: Well, cool. So what are you noticing from a social perspective? There's always, in my opinion when you're doing social enterprise, there's always sort of that initial inspiration and thought. Romy: And then there's the reality of all the other things that you find and discover ripple off of that. What was your original, and what are you starting to witness? Matthew: Yeah, so I think one of the originals for me was just the fact that it could really help people save money, you know? But a lot of, for me personally, I was in a situation when I was working on a socially conscious company out in Los Angeles. And there were months that were really, really tough. And in those months that it was really tough and I was sort of running out of money, I wanted to leave town and go camping, but I didn't necessarily have all the camping gear. And that was the type of situation where if I needed a bundle of camping stuff, it would've been really, really expensive for me to go out and get it; and if I were able to just rent that stuff from my neighbor, for a much, much lower cost, it's something I only want to do once or twice a year, it would save me just so much money. As soon as Lenny called me and told me the story about wanting to rent a bike, that's the thought, and that's the story that I immediately went to. So I think for a lot of people it'd just be really helpful in terms of gaining access to more stuff that you need just for a day or two. And I think that a lot of people are waking up to this thing where the physical things in our lives aren't that valuable, and it's really the experiences that we have. I think that people in general are waking up to this thing where we just want access, we don't want don't necessarily need ownership; ownership over all these products and things aren't what make us who we are, and we wanna have really valuable experiences with the people that we love. So that immediately for me was like, if this can save people money and can allow people to gather experiences with people that they love and do new things, than Jonji's gonna allow people to live better lives. Romy: That's kinda sort of a generational problem from people older than me, and ... All right I confess I'm 50 okay so I'm in the baby boomers, but like that's like ... It's been this cool transition. I was blessed early on to be a mission work around the globe, so I had a different view on accumulating stuff. Romy: It seemed like really, it seemed like literal baggage to have that much stuff. Like I was always in this mode of like I gotta transport this somehow, it's not coming with me, you know? So, I get what you're doing, but that's a big pivotal change for some folks. Romy: Especially the folks with with all the stuff. Matthew: Right. The great thing about Jonji is you don't have to let go of it. Matthew: It comes back. So you're not selling it; you're helping someone else out. And that's like, don't you wanna help someone? Matthew: So I mean, a great Jonji list thing would be if you're walking around your house, and you're like, "Should I get rid of it?" Or ask yourself, "Do I use this everyday?" And if you don't, you could probably list in on Jonji. Matthew: Oh, the social impact, yeah. For me, it was just like even if we could just even the playing field a little bit. Like I always say to the team, "Let's never let any of these protegees fall through the cracks." There's people out there who just don't have some of the same opportunities as we have, and that's trying guitar, or playing soccer, or being a hockey goalie. I was lucky enough in life to be able to do that, but not everyone knows that opportunity, and I kind of want to give everyone that opportunity, 'cause I don't want to miss out on the next Jimmy Hendricks 'cause his family couldn't afford to let him try out the guitar. With Jonji now his dad might be able to let him try his new weekly passion until he finds out what he likes. Yeah there's so many benefits. Matthew: The renting. Just starting to realize, I had no idea. Romy: What are some of the things that you're surprised it rented? Like was there anything that went on there that you're like, "Hmm, I wonder if that will rent?" Matthew: Yeah, for sure. Well, also just to give you an idea, we just launched a couple months ago, we've had four total transactions. Just four total transactions on the marketplace take place. The first one, I don't think was too unexpected, it was just a carpet cleaner. Someone wanted to rent a carpet cleaner, and it was as simple as that. I think maybe the storage space one was most unplanned thing. Zachary: Weddings. I had a wedding last summer, so a lot of our wedding décor I rented out, my table runners that were in my basement. Matthew: Yeah, so just sort of these spaces in general is really interesting. And there was a woman that was looking to store plants, but she wanted a replant outside once it's no longer winter. So she needed a place to store them for a couple of months with a little bit of sunlight, so I now have about 25 large potter plants in my basement. Matthew: So I essentially rented out my basement to this woman, and if you would have asked me six months ago what would've been one of the first four rentals, I never would've said it's gonna be my basement so someone can store stuff in it. Romy: I love this. It brings me back to this sense of village, you know, connecting together. Matt: Just sort of going form point A to point B, that like if you really, and maybe you can even ask yourself this question too, is like, how many people on your street do you know? And do you talk to on a regular basis? And maybe it is a lot of people, but for me, I only know a handful of my neighbors. I probably only know like ten percent of the people that are on my street, because we drive up, we go into our homes, you know. We're busy with our everyday lives, we're just like sort of stuck on this wheel. And I think that the cool thing about JONEZIE is it's really connecting you to allow the people that are close by and gaining you access, not just to their things that you might need for a day or two, but also gaining you access and sort of like a connection point to everyone that's within a proximity of you. Romy: There's something about meeting your neighbor, where you feel accountable, too. Romy: I think. I think that's such a good thing, you know? Matt: Yeah. And with JONEZIE, we're all about building a tribe. We don't see the people that sign up for JONEZIE as users. Tribesmen, they're part of our tribe, our, or the center of our community. And I feel like, with your neighbors on that site. Like, you only do that, I call it the rule of right, left, and straight across. That it's like to majority of people, that's what they know of the neighborhood. So true. Matt: About, you know, we kind of want, we want to, we want to know our neighbors. Block parties get together; it's building relationships. It's, yeah. Romy: Could this go ... Like, I know, I guess instead of saying what are you, what's your vision like. What are the possibilities of where this could go? Matt: Yeah. I mean that's a great question. And that's something that we talk about so much. You know, we spend so much time thinking about that, and when we first came up with this idea and we first just sort of, you know, had the courage to push it out there and tell people, like "Hey. Like here's our idea. What do you guys think?" I think it was just sort of like the outpouring of like excitement from other people, that really got us going on it and really thinking big. You know? So, with JONEZIE, we're thinking really, really big but we're executing super small. And we're just focused on Detroit, Metro-Detroit and Ann Arbor. And we really want to see what we can do here. But in terms of vision and where it can go, we really see this as If we can be successful here and if we can get people to rally behind us here, and we can create this tribe of people that really believes what we believe and thinks that we consume too much and should be sharing more than we actually are. Then this could be a global platform. And you know, in terms of the channels, I think anyone's guess is as good as ours. But I think that it could be everyday household items, it could be things that we probably haven't even though of yet. Romy: Yeah. Right. You just never know what seasons too, what people are going through in their seasons. Romy: As they age, they can go, you know, as your tribe ages, different things will get traded back and forth. I love sort of this old fashion idea of trading, you know? Matt: We get to build together, bringing back the post. Romy: And I love the network. What? Matt: I said bringing back that post. That sounds like a great idea, I would love it. Romy: (laughs) I know, right? But you guys are, in a digital way. And I love that. Romy: I love that. And it kind of goes with this pretext of like the Airbnb's and all of this, that is sort of the forerunners of all this. What item would be too small, do you think, for people to list? Matt: Like you said, as of right now at JONEZIE we're a little more spread apart, so you got to take it into consideration. If it's not worth your time, if it's easier for you to go buy it than rent it, you're going to go buy it. Matt: It jumps straight to all things, so it's going to take some time and the longer JONEZIE's around, the easier that's going to become. And the smaller the ticket can become. Matt: While we are around, the more people that start using it, the more things that we have in the marketplace. So eventually, one day, the angle for me, is to literally be able to walk out of your house, and go down the street, and rent something from your neighbor, and come back home. Matt: A long road down that. Romy: Disruptors though. That's good. Matt: Yeah it is. Yes. Romy: It takes a minute for the rest of the world to catch up, because I think us disruptors, I think we're what? Only like 13% of the world? Romy: "And see how this turns out." And I get it, we get it. Romy: Love them into the tribe, right? Matt: For sure, I love that. Matt: Yeah, that's, that's amazing. Matt: I mean even now, like, I'm like "Lenny, that happened?" And he's like, "Yeah, a week ago." And I'm like, "So much happens that, you know, I feel like it's months and it was so long ago." And he's like, "Three weeks ago." Matt: So like everyday there's like something new and crazy coming our way and it's so exciting, and we have so much fun doing it. And it's just giving me a new passion for life really. Matt: It's the best experience that I've ever had. Romy: It's like the ultimate good social enterprise. Matt: It definitely is, for sure. Romy: Yeah. So for the listeners, and you don't have to disclose your personal, your particular one, what would be ideas if they were going to do something in their country or this, that? What are potential revenue models around this? Could they maybe take part of the fee, or how, what are some of the revenue models you've looked at for this business? Matt: Yeah, and so you're asking how it sort of, how we make money? Matt: Yeah. No, we try to be as transparent as possible about all of this stuff. Matt: Of course. Yeah. So, and we really, we talk about, people talk about brainstorming, right? And it's like you sit down at a table and you talk about ideas. We came up with a new term, it's called sand-storming. And it's when you brainstorm too long and you no longer, everyone is just confused. Matt: Let the dust settle, and come back to the table. And when it came to, like, fees and all of that, we definitely sand-stormed. Matt: We talked about it at length for so long, but I think it was for the right reasons. You need to sand-storm some times, because you need to take it down that rabbit hole, that far, just to know you did it for the sake of things. Matt: And go over the highlights and make a decision from there. And so, yeah I mean that the quick answer there is that we take a total of 20% from every transaction. Matt: We're kind of running a business, right? Matt: We're really approaching this, thinking "Okay, how can we get some power users? Or some people that are going to list just about everything in their house?" They're going to list their car, their trailer, their RV, their bikes. They're going to list their basements so people can store stuff in it. And they're going to have maybe, you know, 20 to 25 different listings. And they're going to focus on JONEZIE as a great revenue source for them. So with that said, we take that fee, because they're setting it up as a business and, you know, we need that money to continue to operate and set them up for success. Romy: Yeah, we want you to make enough. We want you to be here. Matt: We talked about the number and what, what, when we say sand-storming, what is that percentage we need to make sure that we can always, as we grow, keep up with customer service and make it a very great platform that people don't forget about, or use once, or have a bad experience. There was a lot more that kept on coming, to make sure that we can take care of all that. And we finally got to a number where it made sense. Matt: Only thing, the great thing too, is like we only, we only get paid when you get paid. So you know our team is out there trying to, trying to get you rentals and trying to make it a thing of value in your life. Romy: That's so good. There's always, things are always more expensive running a business than you think. Romy: People tell me their budgets, and I'm just like, "That's awesome. Add, just like double that and you're probably in the ballpark." Matt: Yes. I was there. I was quite naïve with my first business, making backpacks, selling backpacks. We've talked about this in the past. I was making backpacks in factories in Los Angeles, and your purchase helped provide scholarships for students. The business was called Stone and Cloth. And when I first started that company, I didn't think anything about margin. I was just, you know, I was like "I want to sell a backpack for, or I want to make a backpack for $25 and I want to sell it for $50. And I want to take that other $25 and I want to donate it to charity." And it was like, it took like so long for people to be like "That doesn't make sense. Like, you can't give all of your money away to charity and to try and put kids through school Because A: you're not going to be able to pay for the business expenses. You aren't going to be able to pay yourself, you're not going to be able to pay your rents, and you're not going to be able to eat." So that, or like scale and grow the business. Or make security. Matt: It was just, you know, it was just a really ... It was, finding that balance is really challenging, you know? Because I think that there are so many people that truly just want to build something that's valuable to the world. And they're like, "Oh I don't need money, I don't care about money. I'm not motivated by it. But at the end of the day, there's just a certain amount of money that you need to make in order to really focus on the work and to have a positive impact in the world. Romy: I kind of have some partner, my sister came on as my partner because I would tend to like give away the shop. I'd be like "Oh yeah, we'll do it for free." Romy: Even my 25-year-old son. He's like, "Mom. Like, you've got to stop doing this." Matt: Yeah, the thing about the scammers, is just they're not safe. I have to say "What?" "So I need something." "All right, here you go." Romy: Right, right. I know. So it's good to have that element of sharing but it's good to have, you know. It's good that we use the tools. We still need tools to make it all go awhile. But you guys, this has been so awesome talking to you. How would, maybe one of the listeners, get in touch with you? How would they find you on websites, social media? How do they list something? Matt: Yeah. So you can list something at JONEZIE.com, we recommend anyone that's listening to go to JONEZIE.com and to sign up. And get in touch with us directly, like I said, we are in BETA right now, so we're looking for all of the feedback that we can get. If there's anyone that wants to reach out and has ideas for us, or wants to become a part of the tribe, we welcome them with open arm. So JONEZIE is J O N E Z I E dot com. We also have an Instagram and a Facebook, so you guys can follow us there. But we do really encourage people to sign up on JONEZIE.com. And people can also just email us if they want to chat, it's just Matt@JONEZIE.com and lenny@JONEZIE.com, if anyone wants to chat. More than happy to talk with people and just sort of spitball ideas. Romy: All right, thank you for offering that. That's so awesome and generous of you guys. Romy: So pineapple's important to you, and let's sort of land on that as we close out. Matt: Yeah. Um, so. If the pineapple is, well the first thing that we always talk about is we want to create longer tables, not taller walls. And, sort of like we talked about earlier, we really want to create a platform that allows people to connect with others around them. And what we've realized is that, at some point, learn that the pineapple is a symbol for hospitality, warmth, welcome, and good luck. And we want JONEZIE to be this open platform that's completely inclusive. And when anyone becomes a part of the tribe by signing up for JONEZIE, we want them to feel warm, welcome, and hospitable. So, that's our symbol. It's really actually in the process of becoming our logo, but it's watermarked all over our website right now. Lenny: They'll see it everywhere. Matt: That feeling of hospitality is what we want everyone to feel when they become a part of this, of JONEZIE. Romy: Aww, that's good. Well thanks for, landing us on that. Romy: And I look forward to coming back and hearing more of your story. Romy: Thanks for being on the show you guys. Romy: Thanks, Matt and Lenny! We would encourage everyone to give it a try. We look forward to seeing what happens with this great platform. That reminds me, I better get to listing my stuff! Okay, while I am doing that, I want to leave you with another great artist's song provided to us by our friends at Assemble Sound of Detroit. Please meet Astray and his song "My Empress."